Toronto is home to some seriously eye-catching architecture, featuring a whole slew of uniquely designed buildings worthy of your camera lens and go-to Instagram filter. But which ones are the most noteworthy? That’s a matter of opinion, but if you want to narrow it down, here are eight buildings and structures that represent some Toronto’s most impressive architecture. The Art Gallery of Ontario is home to a collection of more than 90,000 works of art, but it’s not just one of the most distinguished art museums in North America. The AGO is also one of the city’s most unique buildings thanks to an architectural expansion by world-renowned, Toronto-born architect Frank Gehry, which was completed in 2008. Some of the highlights of Gehry’s reimagining of the AGO include the stunning glass and wood façade that spans 600 feet along Dundas Street and rises 70 feet above street level and the beautiful sculptural staircase that rises up from the second floor. Roy Thompson Hall first opened in 1982 with an inaugural gala concert featuring the Toronto Symphony Orchestra and the Toronto Mendelssohn Choir. The 2,630-seat Toronto concert hall is most notable for it’s unique curved design with a huge glass canopy reminiscent of a giant honeycomb encasing the lobby areas and auditorium. The hall underwent a major renovation to improve acoustics, which saw it closed for 22 weeks and then reopened in 2002. Canada’s largest museum of both natural history and world cultures opened its doors all the way back in 1914. Several architectural styles are represented in the building, but the most notable (and what makes the ROM really stand out, is the controversial Lee-Chin Crystal that was added as part of Renaissance ROM, the museum's renovation and expansion project. The massive crystal jutting out of the main building is made of steel, aluminum and glass and rises ten storeys high, with the tip of the crystal hanging over the sidewalk and looking like an art piece in and of itself. The world-renowned museum currently holds six million objects in its collections showcasing art, archaeology and natural science. 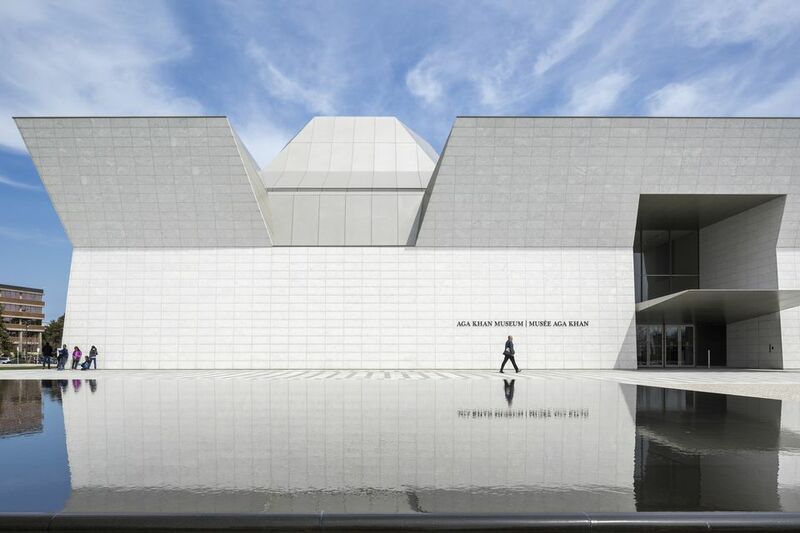 A quick 20-minute drive from downtown Toronto will get you to one of Toronto’s most eye-catching buildings – the Aga Khan Museum. Designed by Pritzker Architecture Prize-winning architect Fumihiko Maki who used light as his inspiration, the museum has a contemporary design that also incorporates historical elements of Islamic cultures making for a truly unique façade and interior. Across from the Museum you’ll find Ismaili Centre Toronto, designed by renowned architect Charles Correa and the two buildings are connected by serene Aga Khan Park. Completed in 1977 and designed by Raymond Moriyama Architects, the Toronto Reference Library offers a bright, airy space for people to work, study, read and gather. The first thing you’ll notice walking up to the building is the large two-storey glass cube that makes up the entrance, which was formerly dark and uninviting. Once inside, it’s the five-storey tiered atrium, inspired by the Hanging Gardens of Babylon, that really takes the cake in terms of eye-catching design. And if you need some caffeine to fuel your studies, there’s now a Balzac’s Café at the entrance, which opens into the library’s main public space as well as Yonge Street. One of the most interesting buildings in the city has to be OCAD University's Sharp Centre for Design, home to OCAD U’s Faculty of Design. Opened in 2004, the multi award-winning, black and white structure resembling a massive tabletop, stands above OCAD University’s main campus building on 12 multi-coloured steel legs. The design of Toronto’s new city hall was regarded as a significant shift in the city’s architectural landscape. The design in question was chosen through an international competition, which attracted over 500 competitors from 42 countries with the winner being Viljo Revell of Helsinki, Finland. Today, City Hall as well as the adjacent Nathan Philips Square, is one of Toronto's best known landmarks, with its curved twin towers white overlooking a disk-like, otherworldly council chamber. Dating back to 1892, the iconic (and oft-photographed) red-brick Gooderham Building can be found at 49 Wellington Street East at the intersection of Church, Wellington and Front streets. The building's triangular shape means that it’s most commonly known as Toronto’s Flatiron Building. Situated on a triangular patch of land in Toronto's St. Lawrence Market District, the Gooderham Building was declared a historic site in 1975.